Doing chemistry with baking soda, cabbage and an oven. Ramenizing things is super popular right now. The idea seems to have originated from the Ideas In Food crew, and is obviously adapted from the practice of making Ramen in Japan and similar alkaline noodles in China. In those recipes, the secret is incorporating an alkaline ingredient (such as kansui into the dough when making noodles). This leads to a tender and springy noodle, without egg or other proteins. Ramenizing is an attempt to cheat, to introduce the ramen texture into western pasta, rice, and other foods. Most people online seem to be doing their ramenizing with Sodium Bicarbonate, the least interesting of all bases. It's the Fred Rogers of bases: always friendly, always useful, and you don't mind having it around your home. Baking soda's mild-manneredness is good for safety, but not so good for actually being an effective base. What else could we use? First, there's Lye. Lye has a long tradition as a kitchen ingredient, most notably for making pretzels. Lye is scary. You don't want to mess with Lye. Then there's slaked lime, or calcium hydroxide. It's also popular in the kitchen, both as an alkali and as a source of calcium for firming up pickles. Slaked lime's biggest claim to fame is as the motive power behind Nixtamalization, the magical process that both softens the corn husk and staves off malnutrition. Having slaked lime around the house is a bit less scary than lye, but still not common. Finally, there's sodium carbonate. This is baking soda's big brother, a powerful alkali with a long history as a food ingredient. Sodium carbonate grabbed the attention of the online food world back in 2010, when Harold McGee wrote about making it at home. Now, I'm not somebody to doubt Mr McGee. On Food and Cooking is one of my favorite books, and an endless source of fascinating information about food. It's also a useful source of information to share with the kind of person who needs some encouragement to go home after a dinner party. Making sodium carbonate at home is super simple. 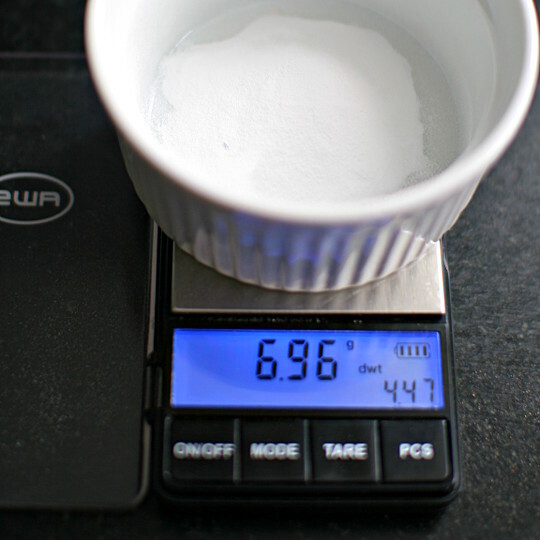 I took 11g (about 2 teaspoons) of baking soda, spread it out on a wide glass dish, and baked it in the oven at 150 Celsius (300 f) for about an hour. That yielded about 7g of a fine, white powder. The problem with fine, white powder is it could have been anything. Most likely, it could still have been sodium bicarbonate. mass-wise, that's 168 parts of sodium bicarbonate to 106 parts of sodium carbonate, and 62 parts of things that will evaporate away. Assuming I started with pure sodium bicarbonate, I should have ended up with 6.94g of sodium carbonate. Close enough. 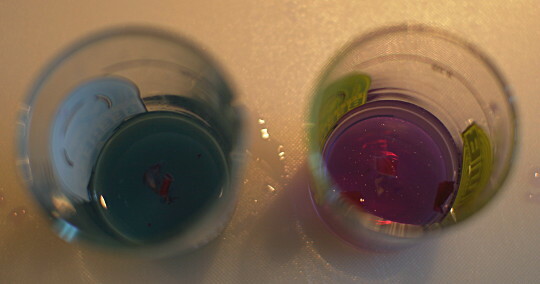 The best test would be to test the pH of the ramenizing solution I made from the salt. Unfortunately, I don't own any kind of pH measuring device. I had to turn to every kid's favorite food-grade non-toxic indicator: red cabbage water. Making red cabbage water is super easy: start with that red cabbage that's been lying in your fridge since the 90s, chop it up fine, fill a cup with it, top up with water, and microwave until warm. Depending on the age of your cabbage, the resulting smell is either fairly pleasant, or disastrous. Either way, ignore it. The smell's not important. It's all about color. I made two solutions, both 1% sodium xcarbonate and 0.5% salt. Then, I dropped a quarter teaspoon of each into separate glasses of cabbage water. A control glass got a ml of StarSan, which turned the cabbage stunning pink. The bicarbonate glass stayed stubbornly purple. The sodium carbonate glass went a beautiful baby blue. Success! The next step was to soak pasta in the two solutions. After two hours, the dried pasta had become pliant and stretchy while remaining firm in both solutions. One of the things people look for in alkali noodles is a yellow color. The carbonate pasta was much yellower, having taken on the deep yellow hue of egg pasta. The bicarbonate pasta remained wan. Soapiness is probably not desirable in a pasta dish, so I washed both down a few times before boiling for three minutes in plenty of salted water. Both samples were firm, with a bit of chewiness but none of the stick-to-your-teethiness of under cooked pasta. Of the two I preferred the carbonate pasta, a little springier and stretchier, with no signs of being soft. My test subject preferred the bicarbonate pasta, citing less chew. On looks, the yellowness of the carbonate sample won out over the pallid bicarbonate one. 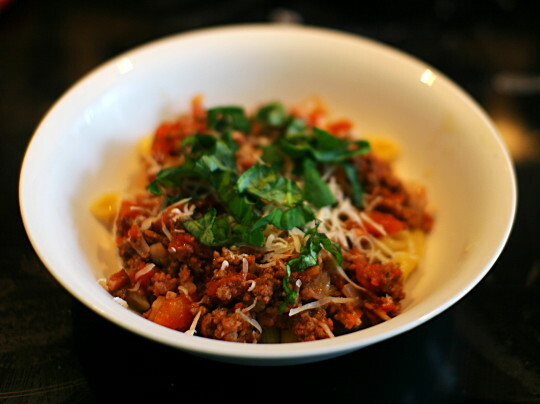 The final bowl, when combined with a meat sauce and some fresh basil (thanks Aerogarden, for my unending basil glut), was excellent. 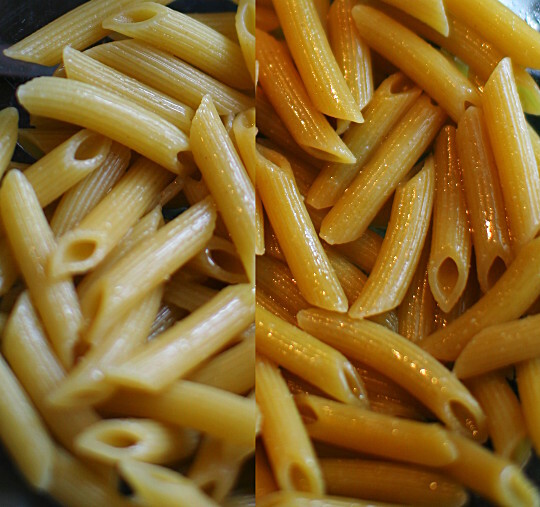 The texture of the ramenized pasta is different from both fresh and dried pastas. It's springier and chewier, which I enjoyed. The end product would probably be more at home with a broth than a chunky meat sauce, but it was still good.